Fan Chen, Doctor of Medical Science, Director at Geo-Life, Inc. His responsibilities at Geo-Life are setting the policy for the organization, determining the organization’s programs and services as prescribed by the articles of incorporation. Approving the strategic plan and working with and providing design support to the engineering staff. Doctor of Medical Science Nagoya University School of Medicine, Nagoya, Japan. Bachelor of Medicine, Beijing Medical University, Beijing, China. 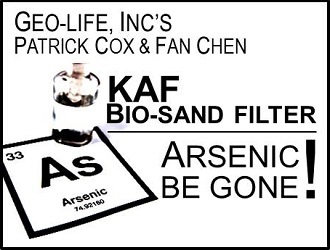 KAF Bio-Sand Filter: Arsenic Be Gone!